Which juicer has the highest yield? Getting the most juice from fruits and vegetables is a basic requirement of every juicer. 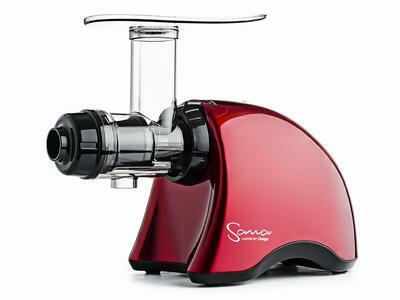 It is important to know which juicers have the best yield before you buy one. Before looking at the rankings, remember that the yield is directly tied to the quality of the produce. Fresher produce (firm and juicy) will always have higher yield regardless of the juicer. On the other hand, even the best juicer will have poor results with things like dry apples, overripe mushy pineapples, or limp spinach leaves. Any type of juicer will produce juice from fresh fruits and veegtables. The differences between juicers lies in the nutritional quality of the juice, the flavor, the yield, and the time it takes. One basic rule of thumb: lower speed juicing gives higher yield and quality. 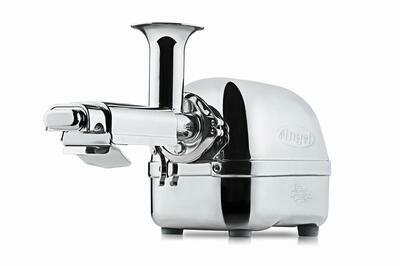 The dual counter-rotating augers in twin-gear juicers squeeze produce almost to the last drop. The pulp is very dry, especially from leafy greens and root vegetables as well as apples. The main disadvantage is the force required to push produce into the augers, especially with larger carrots. Also cleaning is a little more complicated with these types of juicers. But these disadvantages aren't significant if you want the absolute highest yield and smoothest juice. In second place come the single-auger slow juicers. These use a large slowly-turning screw to "chew" produce, and press it through a two-stage juicing screen. Single auger juicers come in both vertical and horizontal forms, with verticals being a little easier to use and horizontals being more flexible and easier to clean. This type of juicer is the most popular now probably due to the wide variety of things which can be juiced, the ease of cleaning, and the simple operation. 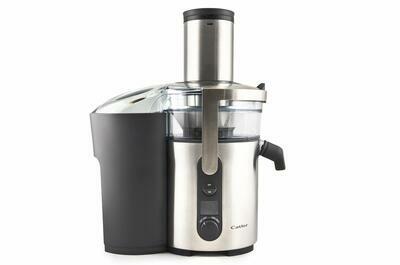 In addition, these juicers make very high-quality juice without foam or oxidation. 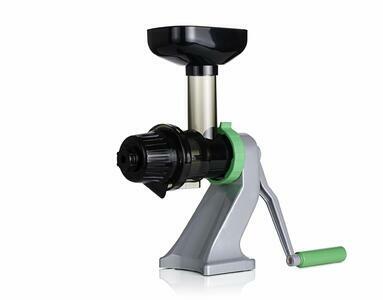 Manual juicers use similar technology as single-auger juicers, except they are much smaller and slower. The yield is lower because it can be difficult to consistently apply the force that a strong motor can provide. However the quality of the juice is similar, and definitely far beyond a centrifugal juicer. Manual juicers are best for juicing small quantities of juice, and are great for taking on holiday or to places without power. Centrifugals are the fastest juicers by far. The high-speed motors make quick work of fruits with a high juice content like citrus or grapes. On the other hand, they aren't suitable for low-moisture produce like leafy greens. While they are fast, the high-speed system produces lower-quality juice due to oxidation. And the yield is much lower than in slow juicers - you can see this in the moist pulp produced. We recommend drinking juice from a centrifugal immediately after juicing before oxidation turns it foamy and brown. Or add some lemon or lime while juicing to reduce oxidation. The internet is full of juicer reviews. Some of these are sponsored by manufacturers, and may be biased. There are some infamous manufacturer-sponsored videos out there, but usually people spot the bias (or you may see that comments are disabled for those videos). When comparing reviews from real-world users, keep in mind that sometimes people may have unrealistic expectation from the juicer. For example, someone might complain about getting "only" 500 ml of juice from one kg of carrots, when in reality that is a good result for a single-auger machine and much more than from a centrifugal. You might also be interested in this: Which juicer is easiest to clean?